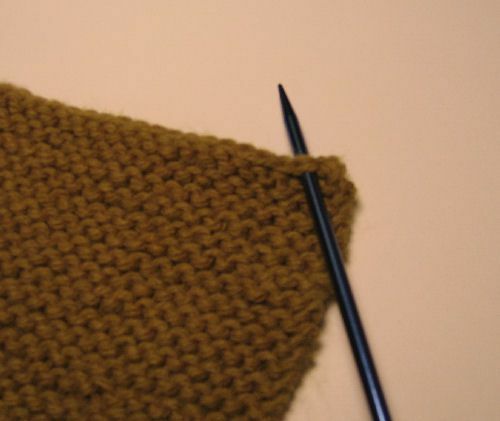 Picking up stitches is an easy way to build off of a finished edge on many types of knitwear. You might be asked to pick up stitches to add ribbing to the bottom of a sweater, to add earflaps to a hat, or to make a project seamless, as with the Spring-Colored Felted Bowl. Read the pattern to determine how many stitches you need to pick up. Determine where you will need to pick up stitches in order to evenly space the stitches in the space available. Slide your needle under both parts of the V of the stitch on the very edge of the work. Some people prefer to work with only one part of the stitch, which is also fine, while others work one stitch in from the edge. This is useful if you have a messy edge and want to form a cleaner line in your project. Just make sure you keep picking up stitches straight across the work. Be consistent and don't wander from row to row. In knitting patterns, you will sometimes see the instructions "pick up X stitches" and at other times, "pick up and knit." The terms are often used to mean the same thing. Once you have picked up the stitch along the edge of your work, you have to knit it in order to make it look like a normal, workable stitch. This can be accomplished using just one needle, or you can pick up the stitch with one needle and knit it onto the other needle, whichever is easier for you. Some people also use a crochet hook to help pick up stitches and pull the working yarn through. If you do this, all you have to do is slide the loop from the hook to the needle and you have a completed stitch. Now that you have picked up and knitted one stitch, simply continue in the same manner until you have picked up all the stitches that you need. You can then work with these stitches just like you would work with any cast-on stitches. Even spacing of picked up stitches will ensure a smooth edge. There are times where you will not pick up a stitch in every edge stitch but use every other stitch instead. Count your stitches on an edge and compare this to the number of stitches you need to pick up for the pattern. This will give you a good idea for spacing. The nice thing about picking up is that it's as forgiving as crochet. If you find that the spacing just isn't working, simply rip it out and start over. Stitches can be picked up around an afghan to make a nice border. However, if you have a very large blanket, it can be a challenge, will require a long circular needle, and it is time-consuming. You might want to consider a quick crocheted border instead. Picking up stitches to add to a piece of knitting is different than 'picking up' a dropped stitch. If you notice a missed stitch after a row or two, you will want to use a new technique to pick up that dropped stitch.